The enchanted, ethereal green dragons live only to serve the forces of nature and uphold the balance between mortal creatures and the ever-evolving world. The enchanted, ethereal green dragons live only to serve the forces of nature and uphold the balance between mortal creatures and the ever-evolving world. The green dragonflight, ruled by the dreaming goddess, Ysera, holds a special love for the night elves and their druids. 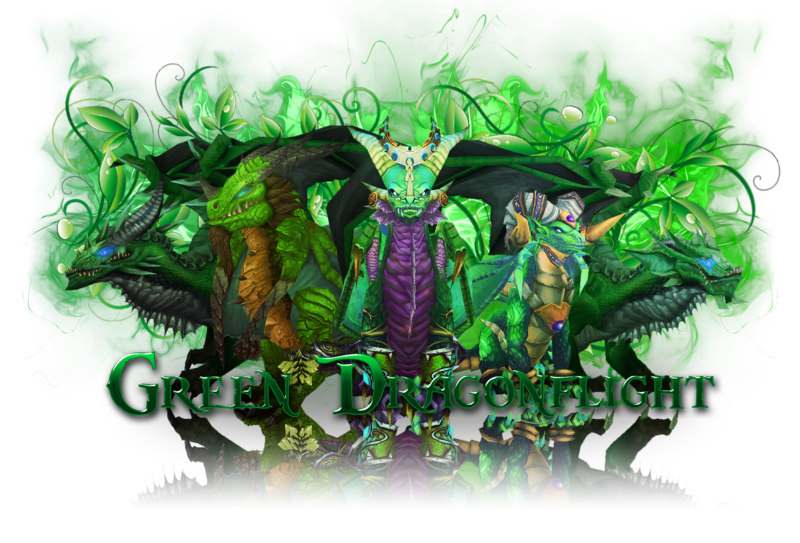 Green dragons are creatures of the Emerald Dream, the ethereal dreamworld that all life is tied to. From there the green flight watches over nature, often assisted by the night elven druids. The dragons and druids work closely together within the dream where they can control the ebb and flow of nature and influence the evolutionary path it takes. Greens are, like the other flights, highly intelligent and always striving to learn more about the world they were entrusted to protect, fretting out the mysteries of creation and life - but keeping all such secrets hidden within the Emerald Dream. As a result the greens are often the least interested about happenings in the mortal realm and must often have any major events brought to their attention by the dragons of other flights. The green dragons pay the deepest respect to their former Aspect, Ysera and have a strong connection with the Wild Gods. The green dragons face the corruption of the Nightmare. The green dragons have also aided against the Black dragonflight, the Twilight dragons, and the Aspect of Death, Deathwing. As a result of their relationship with the kaldorei, many green dragons prefer to transform into night elves, though quel'dorei disguises are also common. Members of the green dragonflight occasionally have names ending in "us" for males, or "ra" for females. Sometimes terms relating to sleep and dreams find their way into their nicknames as well. Before the Titans departed Azeroth, they charged the greatest species of the world with the task of watching over it. In that age, there were many dragonflights, yet five flights, one of which was the green, held dominion over their brethren, and were chosen to shepherd the budding world. The greatest members of the Pantheon imbued a portion of their power upon each of the flights' leaders. After blessing the red leader, Eonar also blessed Alexstrasza's younger sister, the lithe green dragon Ysera, with a portion of nature's influence. Ysera fell into an eternal trance, bound to the waking Dream of Creation. Known as the Dreamer, she would watch over the growing wilds of the world from her verdant realm, the Emerald Dream. You are bound to the waking Dream of Creation. Nature is your realm, and all things have caught glimpses of the Emerald Dream when they sleep. You see them all, Ysera. And they see you, though they may not know it. Like the Life-Binder, you touch all living beings, and sing to them the songs of creation and interconnectedness. When the night elves inadvertently called the Burning Legion to the world, the Aspect of the Earth, Neltharion, suggested creating a magical artifact to aid in the destruction of the demons. Ysera, showing only the briefest moments of doubt, gave much of her own essence toward the creation of this object, called the Dragon Soul. When each dragon had contributed a portion of his or her essence to the artifact, Neltharion deemed it complete. The greens joined the other dragons in flight over the battle and the Black Aspect brought the Dragon Soul to bear against the Legion, with devastating effects on the demonic swarm — but only for a precious few moments. He then shocked his fellow aspects and turned the artifact against the terrified night elves as well, and finally his own brethren. The shocked dragons were helpless to resist the power of the Dragon Soul, for it contained a fraction of the essence of each — with the exception of Neltharion himself. All the dragonflights, save Neltharion's own, were paralyzed in midair until the timely intervention of Korialstrasz, a mate of the red dragonqueen, who had been absent from the initial use of the artifact. While Korialstrasz was no match for the Aspect of Earth, he did manage to interrupt Neltharion's concentration for a moment, freeing the other dragons from their paralysis and allowing them to act. Malygos, infuriated at the betrayal by his ally, struck first, but at a great price. As the blue dragonflight flew into formation to attack Neltharion, the mighty black wyrm unleashed the full fury of the Dragon Soul against them, and the power instantly slew nearly every one of them. As the other dragons turned to act, Neltharion retreated, leaving the blue dragonflight broken in his wake. Wounded and shocked, Ysera and the other noble dragons were forced to abandon their mortal allies. The dragonflights secluded themselves, hoping to recover from the Dragon Soul's powers, but the damage to the draconic race had been done. The Kaldorei and their allies just barely managed to defeat the legion, but at great cost. Azeroth was sundered. Deathwing’s betrayal was so destructive that the five dragonflights never truly recovered. If that had not been enough, the ensuing war between the dragonflights decimated the species, and the greens were no exception. They would never again be seen in the same numbers as before. The age of dragons had passed. To ensure Deathwing would never hold power over dragonkind again, Alexstrasza, Ysera, and Nozdormu placed an enchantment upon the Demon Soul, so that no dragon could wield it, and hid the foul disc deep beneath the earth. The trio later visited the Night Elven survivors to present the devastated race a gift. Alexstrasza had planted a colossal tree within the new Well of Eternity that would come to be known as Nordrassil. Both Ysera and Nozdormu placed their blessings upon it. Ysera bound the tree to her realm, the Emerald Dream, along with the night elven males, now the druids of their race. As part of the pact, the druids agreed to sleep for centuries at a time so that their spirits could roam the infinite paths of the Emerald Dream alongside the green flight. Though the druids were grieved at the prospect of losing so many years of their lives to hibernation, they selflessly agreed to uphold their bargain with Ysera. The greens, with the druids' help, maintained their posts through the long millennia that followed. Green dragonflight broods were stationed at several of the Great Trees, defending the portals to the Emerald Dream, where they remain to this day. One particular brood of Ysera's were closely allied with the night elves of the Bloodmyst Isles, whom were ruled by Prince Toreth. Ysera kindly allowed the night elves to ride her children into battle and they were known the Dragon Riders of Loreth'Aran. Ysera's benevolence raised the ire of Deathwing and he launched an attack against Wyrmscar Island where the dragonriders slept. The blacks, including Razormaw, a lieutenant of Deathwing, mercilessly slaughtered the Kaldorei. The greens rose up to protect their allies but were unsuccessful. Not one was spared, though many blacks, including Razormaw, also perished in the battle. The skeletons and spirits of the murdered greens still litter the small island. A thousand years before modern times, the green dragons lent their aid to the night elves and the bronze dragonflight during the War of the Shifting Sands. Led by Merithra of the Dream, child of Ysera, the greens fought the Silithid and their Qiraji masters furiously and ultimately helped push them back to their city where they were sealed away from the world. The dragons suffered few casualties but the progeny of Ysera, Merithra, was believed lost, having charged deep into Ahn'Qiraj during the final push. Merithra had sacrificed herself to close the gates. After the war a shard of the Scepter of the Shifting Sands was entrusted to the green wyrm Eranikus by Anachronos the bronze. The Scepter was supposed to be split between the dragonflights and spread far and thin as to disallow the Old Gods from opening the Gates of Ahn'Qiraj, the scepter held the key to open it and dispatch its magical veil. Unbeknownst to her flight, Merithra, along with Caelestrasz and Arygos, was not dead, simply captured. The dark master of Ahn'Qiraj used the tortured dragons to power his new creations: Moam and the other Obsidian destroyers. The exiled priests of the Gurubashi, servants of the blood god Hakkar the Soulflayer, had fled into the Swamp of Sorrows and erected the Temple of Atal'Hakkar, where they could prepare for his arrival into the physical world. The great dragon Aspect, Ysera, learned of the Atal'ai's plans and smashed the temple beneath the marshes. For a thousand years the temple has been known as the Sunken Temple. The great emerald wyrm Eranikus, consort to Ysera, was dispatched to deal with the survivng Atal'ai priests, along with his brother Itharius, and a brood of green dragonkin to prevent the trolls from any more evil doings. To this day, the temple's drowned ruins are occupied by the green dragons, who prevent anyone from getting in or out. In the events leading up to the Second War, Deathwing led a powerful orc warlock named Nekros to the Dragon Soul — now renamed the Demon Soul. Nekros used the Demon Soul to force the red Dragon Aspect, Alexstrasza, into submission, and forced the rest of the red dragonflight to serve him or risk the death of their queen. Korialstrasz, who escaped by faking his death sought the assistance of the other Aspects to free his queen. While deeply concerned, Ysera did not immediately act to save her sister. Korialstrasz had pleaded for assistance but had been turned down countless times by Ysera's consorts. Eventually Korialstrasz found a way to speak with the Lady of the Dream directly and Ysera agreed to do what she could in assisting to free the Red Aspect. Ysera spoke with Malygos and Nozdormu and convinced them to act as well. With the Aspects convinced, Korialstrasz waited until Nekros brought Alexstrasza and her eggs out of the fortress, just as Deathwing had desired. When Deathwing made his appearance, Ysera and the others arrived and proceeded to battle Deathwing in the sky near Grim Batol. Korialstrasz's human apprentice, Rhonin, defeated Nekros and used one of Deathwing's scales to destroy the Demon Soul. The destruction of the artifact released the ancient power that had been sealed inside for millennia, making the Aspects whole once more and allowing them to overpower Deathwing and force his retreat. This final battle was known as the Battle of Grim Batol. Following the Battle of Grim Batol and the restoration of their power, Ysera and her agents continued to uphold the pact made with the titans to safeguard Azeroth, taking a somewhat more active role in the world, though their duties in the Emerald Dream continued to take precedence. The green dragonflight was nearly absent from the battle against the second coming of the Legion, also known as the Third War. The mortal races banded together and overcame Archimonde at the Battle of Mount Hyjal. In the aftermath green dragon guardians were stationed at Hyjal Summit, where they, along with the Reds, Blues, and Bronzes, guard the World Tree from another attack by the remnants of the Burning Legion in Darkwhisper Gorge. In addition, green and red dragons were sent to Sunwell Grove to investigate and guard the remains of the Sunwell. At some unknown point a new threat appeared within the Emerald Dream. This threat, the Emerald Nightmare, is a region of corruption that travels and grows through the dreamscape, twisting and distorting the native flora and driving living creatures mad, including the green dragonkin. These victims became the mad slaves of the Old Gods. Ysera and her flight attempted to fight against this mysterious threat, alongside Malfurion and Cenarius, while trying to avoid becoming its prey. Fortunately the Nightmare did not, at least initially, approach the Eye of Ysera. The Nightmare's influence continued to grow and even began seeping into Azeroth. Many members of the flight became inflicted, including a brood dispatched to the Sunken Temple led by the mighty green consort Eranikus. Not long after four of Ysera's most powerful lieutenants also fell to the Nightmare's sway and periodically invaded Azeroth through the portals found at the Great Trees. Two of these crazed dragons, Lethon and Emeriss, were put down by mortal heroes but their twisted spirits persisted in the Emerald Dream. When the scepter shard held by Eranikus was needed the denizens of Azeroth discovered they would have to bring the green wyrm to Azeroth and cleanse him of his corruption. Remulos lured Eranikus to Moonglade and after a short battle against the dragon and an army of nightmare shades Tyrande Whisperwind arrived, and used the light of Elune to cleanse Ysera's consort and free him of the Old Gods' control. Shortly after the Lich King's defeat, the situation with the Nightmare suddenly intensified. Beings of all races, dragon and mortals alike, became the Unwaking, trapped in their own horrifying dreams. The green dragonflight inside the Emerald Dream were losing ground against the monstrosity and soon nearly the entirety of the dreamscape was consumed by nightmare. Not long after those who remained awake were forced to defend against their own slumbering comrades before being brought to the dream itself to fight in the War Against the Nightmare. Eranikus, who had been hiding away from his love and his people ever since his redemption, was stumbled upon in Ashenvale by none other than the high priestess Tyrande and her companions. Although reluctant to assist them, he did so, showing them the way into the Emerald Dream to free Malfurion Stormrage, held by the Nightmare Lord Xavius. Despite being hindered by the twisted spirits of Lethon and Emeriss they manage to free the Archdruid, but only at the cost of Ysera becoming the Nightmare's newest prisoner. At the climax of the conflict Eranikus sacrifices himself to save his queen while Malfurion and his allies defeat Xavius and manage to seal the Nightmare safely within the Rift of Aln. Following the conflict's conclusion Ysera, along with her sister Alexstrasza, presided over Malfurion and Tyrande's marriage ceremony. Immediately after the two Aspects blessed the new world tree Teldrassil as they had done to Nordrassil ten thousand years before.